In a city known for its meat pies, fish & chips, and other heavy meals, Leon makes waves with a fresh, healthy focus. More than just a tasty lunch spot, Leon completely redefines fast food. Inspired by the zesty flavors of Mediterranean cuisine, the menu here boasts a full selection of seasonal, nutritious dishes for every meal of the day. 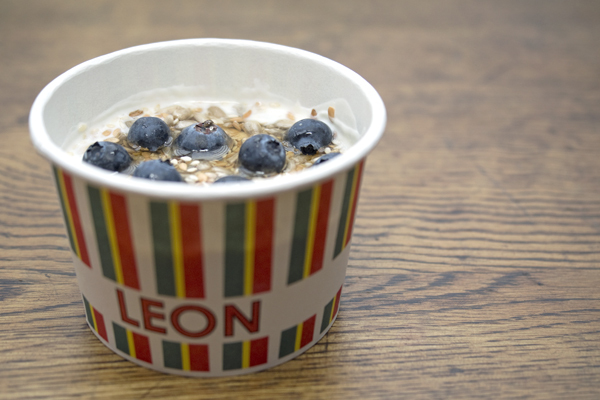 With extensive gluten-free offerings for breakfast, lunch, dinner, and dessert, we can’t get enough of Leon, London’s best healthy fast food. Whether you’re a sweet or a savory breakfast person, Leon has plenty of protein-packed choices to help you start your day right. Sweet breakfast options focus on tart yogurt with a variety of fresh toppings. Choose from blueberries with sesame seeds or bananas with chocolate flakes, both sweetened with a drizzle of honey. All allergens are clearly marked on the menu, making it easy to avoid gluten, nuts, or dairy. Savory breakfast options focus on the classics, including poached eggs paired with everything from saucy beans to chorizo with truffle gruyere. Full English breakfast lovers can even get the Full English Pot, with eggs, beans, and sausage in Leon’s standard moderate size. We loved the egg pot with smoked salmon, avocado, and freshly ground black pepper. For lunch or dinner, Leon features an all-day menu with salads, hot boxes, burgers, and more. The salads here are no dainty affair. 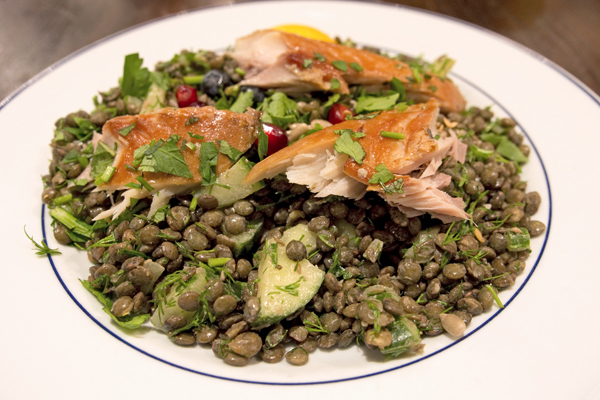 All are packed with healthy proteins like grilled chicken, smoked fish, and even lamb, while fresh additions like quinoa, lentils, and avocado add nutrients and flavor. The hot boxes are similarly fresh and filling, with choices like falafel, green chicken curry, and Moroccan meatballs. Meals are labeled small or large, so you can be sure to order exactly what you like. 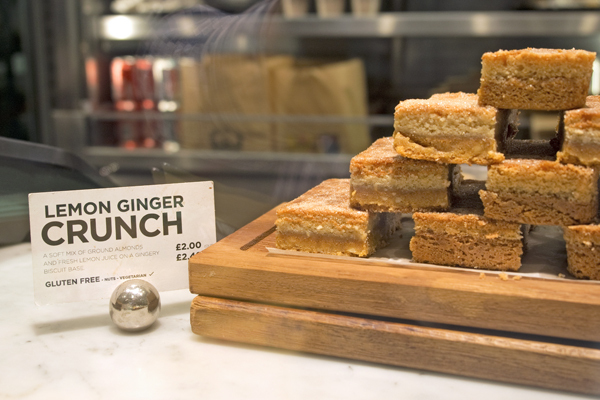 At Leon, London’s love for sweet treats is reflected in the cases of cakes, pies, and tarts. You’ll find that most of these goodies are gluten-free and marked accordingly, from the billionaire’s shortbread to the cranberry bakewell to the pecan pie. 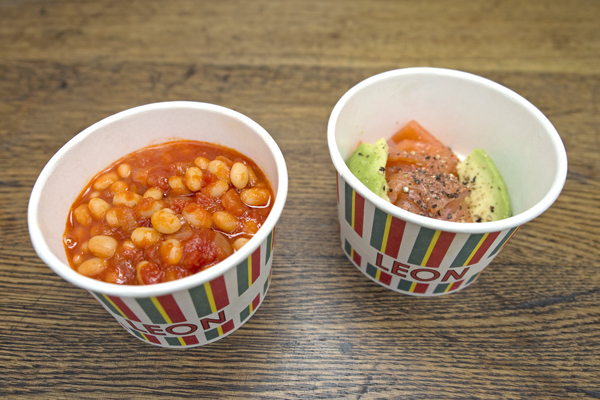 As fans of sweets, we love Leon’s reinvented classic treats, a perfect complement to healthy fast food. Where? 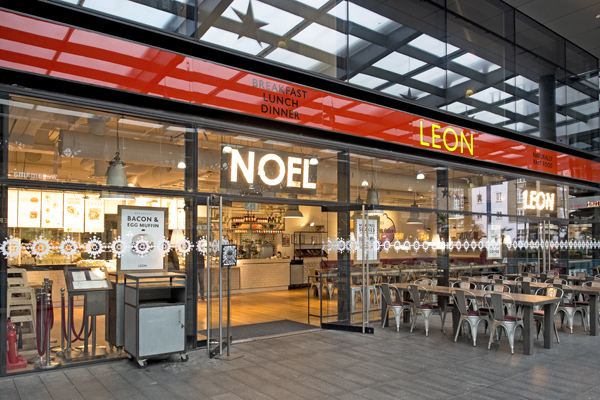 You can find Leon throughout London. We visited the location in Spitalfields Market: 3 Crispin Place, London E1 6DW (+44 020 7247 4369). Disclaimer: Leon graciously hosted us so that we could share our experience with gluten-free readers around the world. As always, all opinions and enthusiasm are our own.